The first time you use the Raspberry Pi, it goes into a program called Raspi-config, which you use to change some of the settings on your Raspberry Pi. Raspi-config options are changed from time to time, so you might see additional options here. info: This provides a short paragraph explaining the purpose of the tool. expand_rootfs: When you flash your SD card, an exact copy of the operating system and its disk formatting is copied to the card. As a result, the SD card can look like it has less capacity than it really does, which means you can quickly run out of space, even on a higher capacity card. One of the first things you should do is use this option in Raspi-config to ensure your Raspberry Pi can use all the space available on your SD card. When you press Enter with this option highlighted, it runs straight away. 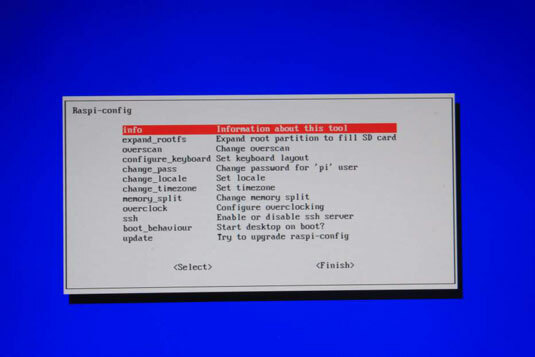 When you next start up your Raspberry Pi, your Raspberry Pi resizes the file system, which can take a few minutes, during which the screen won’t update. The new capacity then becomes available to you. overscan: The overscan settings control how much of a border should be used around the screen image and can be used to correct an image that spills off the side of the monitor. Raspi-config provides an easy way for you to enable or disable them. If your image is surrounded by a black border you want to get rid of, disable overscan. configure_keyboard: When you press Enter, there is a short pause, and then a menu opens for you to select the keyboard you’re using. Lots of keyboards are listed by name and model number, but there are also options for generic keyboards if yours isn’t. Press Enter to confirm your choice. You are then asked to confirm the keyboard layout for your keyboard. There are additional options to choose an AltGr key if your keyboard doesn’t have one, to choose a Compose key, and to enable Ctrl+Alt+Backspace to terminate the X Server. When you finish configuring your keyboard, you are returned to the Raspi-config menu after a short while. If you have the wrong symbols coming up on screen when you type, try changing the keyboard choice. change_pass: This option enables you to change the password for the default user on your Raspberry Pi, which is the user called pi. You can leave this setting alone, unless you’re particularly security-conscious or are using your Raspberry Pi for particularly sensitive activities. If you change your password, don’t forget it! change_locale: This setting is used to choose your language and its associated character set. You don’t need to worry about this option if you’re happy using your Raspberry Pi in English. change_timezone: Your Raspberry Pi detects the time from the Internet when you switch it on, but you’ll need to tell it what time zone you’re in when you first set it up. memory_split: Your Raspberry Pi’s memory is shared between the central processing unit (CPU) and the graphics processing unit (GPU). These processors work together to run the programs on your Raspberry Pi, but some programs are more demanding of the CPU and others rely more heavily on the GPU. If you plan to do lots of graphics-intensive work, including playing videos and 3D games, you can improve your Raspberry Pi’s performance by giving more of the memory to the GPU. Otherwise, you may be able to improve performance by stealing some memory from the GPU and handing it over to the CPU. The Raspbian Wheezy distribution allocates 64MB to the graphics processor and gives the rest to the CPU. In most cases, this setting will work fine, but if you experience problems, you can change how the memory is shared between the two processors. The Raspi-config program asks how much memory you want to give to the GPU and fills your entry box with the current value as a guide. The rest of the memory is allocated to the CPU. overclock: Overclocking is making a computer work faster than the manufacturer recommends by changing settings. Overclocking is provided as an option in Raspi-config, and using it does not invalidate your warranty. The menu warns that overclocking may reduce the lifetime of your Raspberry Pi, but the Raspberry Pi Foundation says it is confident you can use the new settings without any measurable reduction in your Pi’s lifetime. You have five different presets to choose from. The speed of the CPU is measured in MHz, and the highest overclocking setting increases the speed from 700 MHz to 1000 MHz. You won’t necessarily be able to use the top setting: It depends on your Pi and your power supply. If your Pi doesn’t work with your chosen setting, hold down the Shift key when you switch on the Raspberry Pi and overclocking is disabled. You can then go into Raspi-config to try a different option. ssh: SSH is a way of setting up a secure connection between computers, usually so you can control one computer from another computer. Unless you know you need to use it, you can ignore this setting. boot_behaviour: You can use this setting to make your Raspberry Pi go straight into the desktop environment when you switch it on. update: Use this setting to install an update to Raspi-config if one is available. You need to have a working Internet connection to use this. When you have finished configuring your Raspberry Pi, press the right arrow key twice to highlight Finish, and then press Enter. You might be asked whether you would like to reboot your Raspberry Pi. If so, say yes. Some changes only take effect after a reboot.